GENEVA, Jun 28 2018 - On 25 June 2018, the Geneva Centre for Human Rights Advancement and Global Dialogue organized a World Conference on the theme of “Religions, Creeds and Value Systems: Joining Forces to Enhance Equal Citizenship Rights” at the United Nations Office at Geneva in collaboration with the International Catholic Migration Commission, the Arab Thought Forum, the World Council of Churches, the World Council of Religious Leaders, Bridges to Common Ground and the European Centre for Peace and Development. The World Conference – held under the patronage of His Royal Highness Prince El Hassan bin Talal of the Hashemite Kingdom of Jordan – was addressed by more than 35 world-renowned religious, political and lay leaders from the major regions of the world. 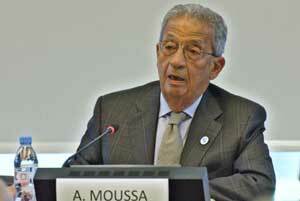 In his statement, HE Amr Moussa – former Foreign Minister of Egypt and former Secretary General of the Arab League – called for ‘dialogue with honesty’ between religions leaders and politicians so as to address today’s challenges related to the enjoyment of equal citizenship rights. “The issue of crisis of religions is suffering from the currents and under-currents going in different ways, or at cross-purposes. Currents are clearly working together trying to find a way out of the crisis we have. Under-currents are perhaps encouraging or financing the negative activities that are producing the problem. The problem is not in the streets between simple people or between the Quran, the Bible and Torah or between any other philosophies: the problem is between the practitioners. HE Moussa concluded his statement underlining that it is “our common responsibility to harness the collective energy of religions, creeds and value systems” to promote their authentic meanings and address the instrumentalisation of religions. “All human beings belong to one family,” he asserted.